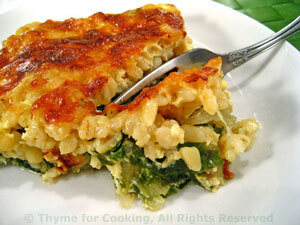 Creamy Barley Chard Gratin, Thyme for Cooking healthy gourmet side dish. 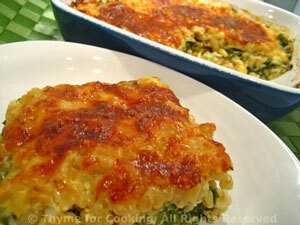 An easy gratin - do the prep work, pop it in the oven and let it finish while you relax. Cook barley in chicken stock until done, usually about 15 minutes for quick-cooking. Wash the chard and trim any bad bits. Stack the leaves together and fold over, the long way. Slice into thin strips, using both leaves and stems. Add onion and chard stems to skillet and sauté until tender, about 7 minutes. Add the chard leaves and sauté until wilted. Remove from heat. Whisk eggs, yogurt and milk together. Spread chard / onion mixture in the bottom of a baking dish just large enough to hold everything. Add barley, spreading evenly over vegetables. Pour egg mixture over the top and bake, uncovered, for 30 minutes, 400F (200C), until nicely browned and set.